Your Child Will Be Prepared! Brandi’s Place teachers help your preschooler shine! Life is a daily adventure when you are a preschooler. Brandi’s Place Early Learning & Childcare Center is designed to be developmentally appropriate for three and four year old children. The Curriculum provides plenty of choices for young preschool children to explore and grow. Children are given opportunities to play as they learn in our stimulating educational environments. Brandi’s Place Preschool and Pre-K programs are designed to prepare your child fully for kindergarten. Like all classrooms we work hard to provide a warm and nurturing environment in which your child can learn and grow. It is during this time we continue to work on independence and development. We encourage children to do things on their own and we begin assigning them tasks that they can do to help out in the classroom. Children help clear the table after meals, help hand out worksheets and materials and help clean up. These types of tasks help children feel needed and appreciated and gives them self confidence. This class is for older three year old and younger four year old children. This class follows a structured curriculum in which various activities change on a daily basis. Active exploration, manipulation, and concrete experiences which form the foundations for future, more abstract learning. 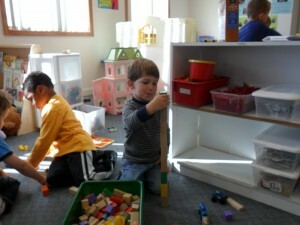 Art, music & movement, dramatic play, language arts, science, mathematics, Spanish, sensory, computer, and free play. Color, shape, letter, number and name recognition every day. Continued social development, such as self-help skills. Focus on early literacy skills such as copying words, writing their name and recognizing sight words and spelling. We will continue to work with each child on numbers, letters, shapes and colors. We will introduce letter sounds and teach them to read books on their own. Pre-K smiles and happy learning! Other skills the children learn include holding a pencil correctly, writing their name, matching, using scissors and telling stories. This is where we continue to teach your child the skills and information they will need to be successful in kindergarten and beyond. Preschoolers thrive in orderly, well-organized classrooms with schedules that allow for a balance of active and quiet activities. Children participate in whole-group, teacher-directed, skills-building learning experiences. Our quality teachers are actively interacting with the children to reinforce the learning acquired during group activities. We often hear that the elementary teachers and principals are impressed by the academics and social skills of children that have attended Brandi’s Place. When your child graduates from our Preschool program you can be sure that they will be completely ready to excel in their elementary school years. At Brandi’s Place we ensure consistency in classroom management techniques, the teachers and parents love it because the children understand that rules, expectations and boundaries are “universal” as they progress through the center and life. The sounds of children laughing and playing are the sounds of Preschool children at Brandi’s Place! We look forward to welcoming you to the Brandi’s Place family! Call (810)-655-3444 TODAY for Your Child’s FUTURE! Mon - Fri 6:00 a.m. - 6:30 p.m.
"We promise that all children under age 5 will have access to high quality learning and care. We are dedicated to having each child kindergarten ready."